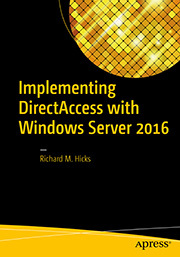 DirectAccess and Windows 10 Technical Preview Build 9926 | Richard M. Hicks Consulting, Inc. Ever since the Technical Preview versions of Windows 10 were out in the open, we have been testing it to our DirectAccess environment. It works, and I suppose it works just as well now that the Windows 10 Final Build has been released yesterday. However, we currently have “Enforce corporate compliancy for DirectAccess clients with NAP” enabled on our DirectAccess environment. The thing is, and we have noticed this with the Technical Previews as well, that Windows 10 no longer seems to incorporate a NAP Client/Agent which will send its status to the HRA Server. Hence it will not receive a Health Certificate and therefore will not be able to set up an Intranet Tunnel. Do you know/have a solution for this problem? 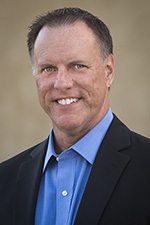 I have seen people posting about doing healthchecks using the SCCM (2012) Agent, but we have no experience with that yet. Would/could that work? There really is no workaround for this. NAP has been deprecated in Windows 10 and the supporting infrastructure on the client has been removed, as you noticed. 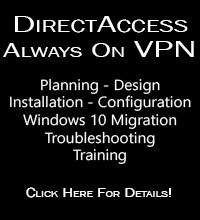 NAP integration is also being removed from DirectAccess in Windows Server 2016. Today, if you have configured NAP integration with DirectAccess, Windows 10 clients cannot be supported. It might be possible to get them to work by exempting them from NAP, but I’m not at all familiar with NAP so I can’t say definitively if that will work. Thank you for your reply! So, if I’m not mistaken, the option “Enforce corporate compliance for DirectAccess clients with NAP” will be vanished in the Remote Access configuration in Windows Server 2016? That’s correct. The NAP integration option will not be included in Windows Server 2016. There will be no way to perform compliance checks on DirectAccess clients unless there’s a third-party alternative. I am not aware of anything like that at this time, however.